edit 01/16/2011: from the comments, the texture i added did the wall no justice, so i added an alternate version that doesn't have the grungy texture with some other edits. I don't remember the last time I made a wallpaper...but it was a very, very long time ago. I kinda got bored and uninspired with photoshop...a block :( DAMN THIS WALL IS HUGE! Outlines = lineart, some vectoring (like the big, solid colors) but mainly painting mukuro and for the shading. Experimented with filters. This is my first painted and "in motion" wall which explains the sloppyness. Awesome wall ! *o* he's so handsome ! cool wallpapaer and its rukudo mukuro! 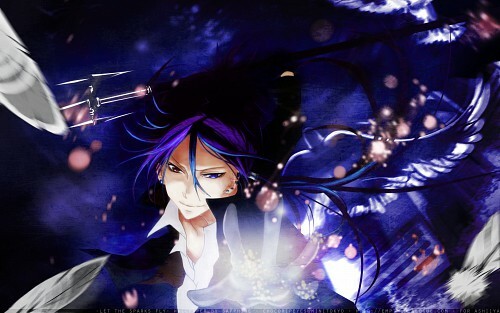 rukudo mukuro with wings! never see him with wings! thank you for sharing. Waa, best character in anime and definitely the favorite! so kool... i luv him! the colors n lighting r great! I personally like the version of this wall without the grungy effects. I love the colors you used in the wall! I really like the feathers. Nice job!